The busy but lackluster July 4th weekend gives way to a quieter weekend at the box office, but with a much better chance at giving us a hit, thanks to the whole, you know, quality thing. Anybody paying attention? Dawn of the Planet of the Apes is the only new wide release this weekend, getting the massive release treatment with nearly 4,000 venues. A sequel to 2011's way-better-than-it-had-any-right-to-be Rise of the Planet of the Apes, it picks up a few years after where the last left off, with a now rag-tag band of survivors of the plague – generated from a genetically engineered virus – that simultaneously fried humans brains and made apes super-smart. When will scientists learn to stop curing diseases? For the time being, we have our really smart chimp colony, living out in the Northern California woods and still led by Caesar (mo-capped by Andy Serkis, and can we get this guy an Oscar nomination already), under the impression that all the humans have left. A surviving group of humans accidentally makes contact, and although initial meetings are peaceful and productive, humans aren't really about to give up our cushy spot on the top of the animal kingdom without a fight. So a fight it will be, complete with chimps on horseback in a cavalry charge using automatic rifles. Here, take my money. The human cast is led by Gary Oldman, Jason Clarke and Keri Russell, which is a respectable group if not exactly cause for ticket buying. Oldman in particular (or at least before his recent unfortunateness) lends some credibility to the proceedings, in the same way that Robert Duvall lifted up all those Jerry Bruckheimer films, but it's really not about them at all. Indeed, the most remarkable thing about the first Apes film in this go about it was how riveting it was for so long when there were no humans at all on screen. Where that film was something of a Spartacus tale, Dawn seems to be aiming at no less than 2001 as its inspiration, trying to find the very meaning of existence as a species. 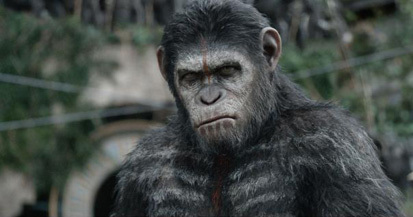 If that seems pretty high-minded for an Apes film, well, why have we stopped asking for intelligent blockbusters? Do you want everything to be a Transformers film? Wait, don't answer that.